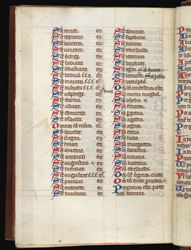 In the twelfth line of the second column on this page St. Osyth appears at the top of the list of virgins, second only to Mary Magdalene, and her name is followed by a roman numeral 'ii', indicating that her name should be invoked twice. Osyth, along with St. Augustine in the first column, and Sts. Peter and Paul on the previous page, are the only saints in the litany to be given this prominence, so the manuscript must have been written for the Augustinian abbey of Sts. Peter, Paul, and Osyth, in St. Osyth, Essex.